CoinOpCollectorForum.com • View topic - Real or not? 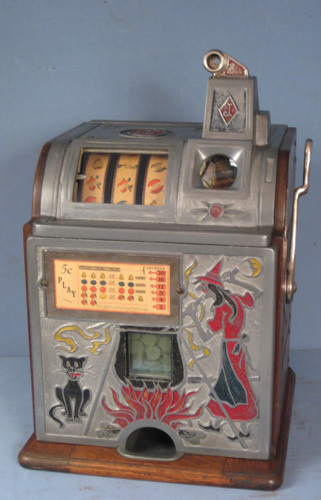 Was considering buying 2 slot machines but I’m not an expert.... just want for my mancave. How do I know if they are original or reproduction? Also, if they are reproduction what is their value? but I see similar ones in every pic I find of these old machines. Any pics of the insides? Also pics of the backdoor and keys? Both handles are wrong, doesn’t mean machines are reproductions. I'm pretty sure they are reproductions but I'm trying to get some pics now. If they are reproductions what is their value?? Thanks! If machine are in fact reproductions I would say $500-$800 per machine.